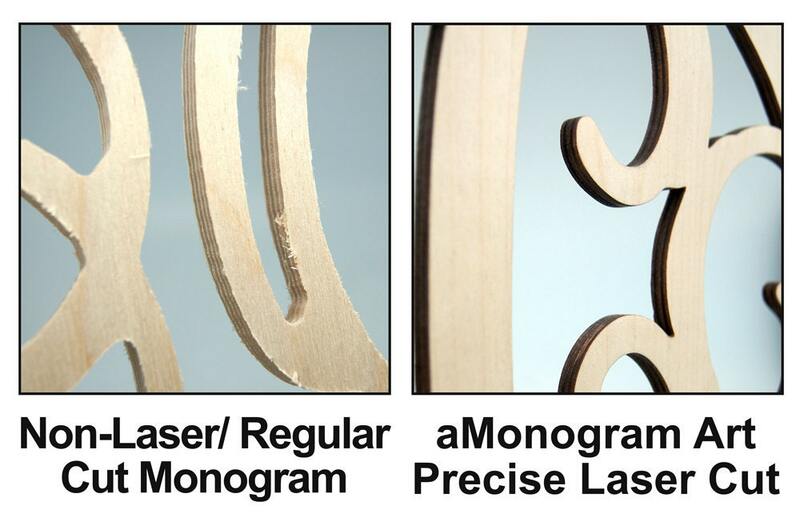 *Our Edge is LASER CUT Edge* See and feel the difference! 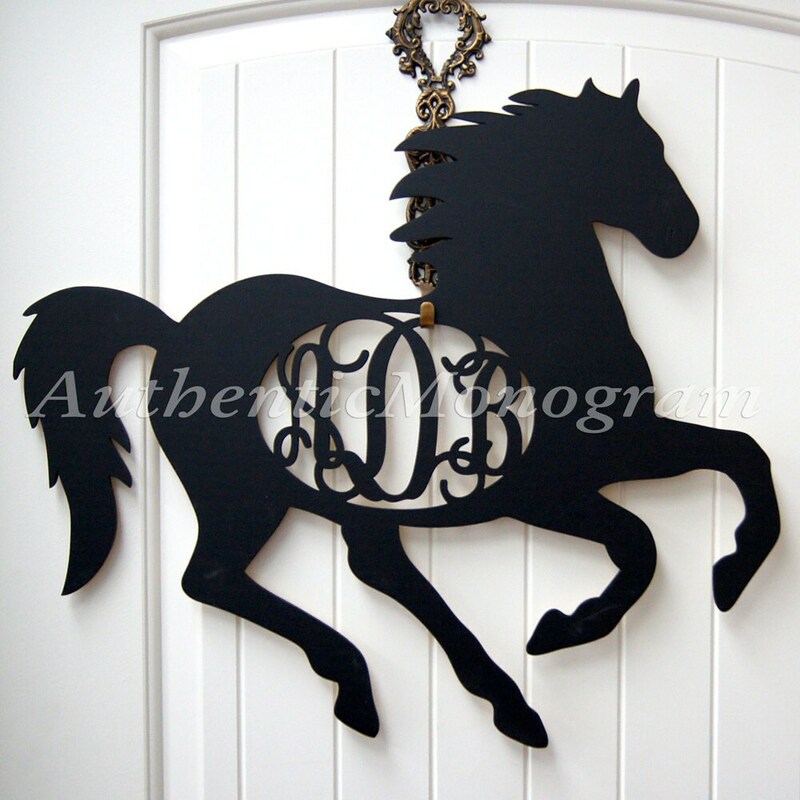 Wooden Horse Silhouette 3 Letter Unpainted Vine Monogram, Unpainted, Initial Monogram, Home Decor, Door Hanger, Stable Decoration. ✧ ¼ natural best quality birch wood. 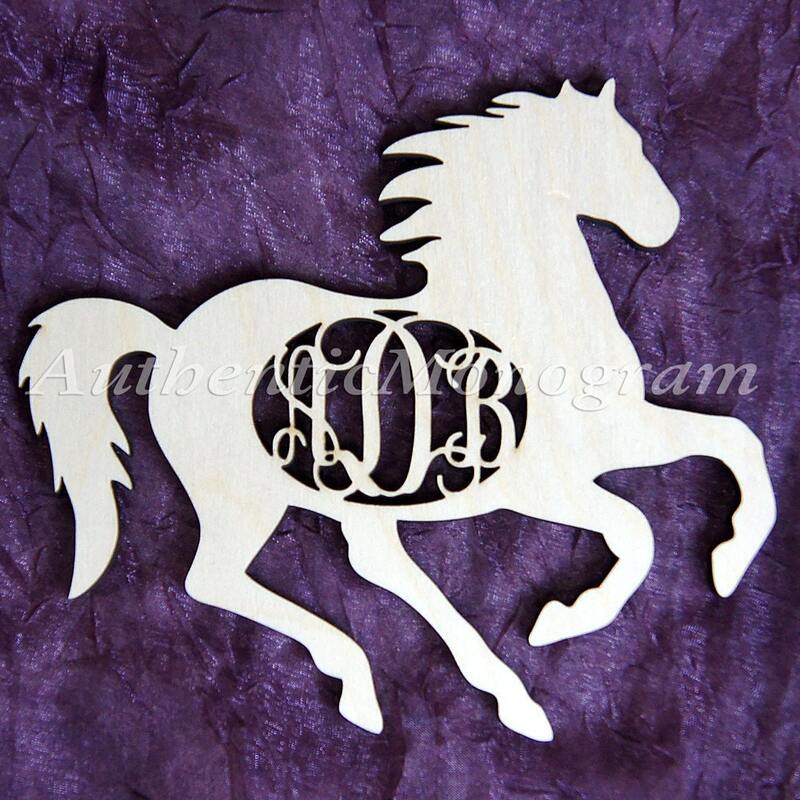 ✧Smooth Edges "Laser Cut Edges"
Our monograms are really works of art. 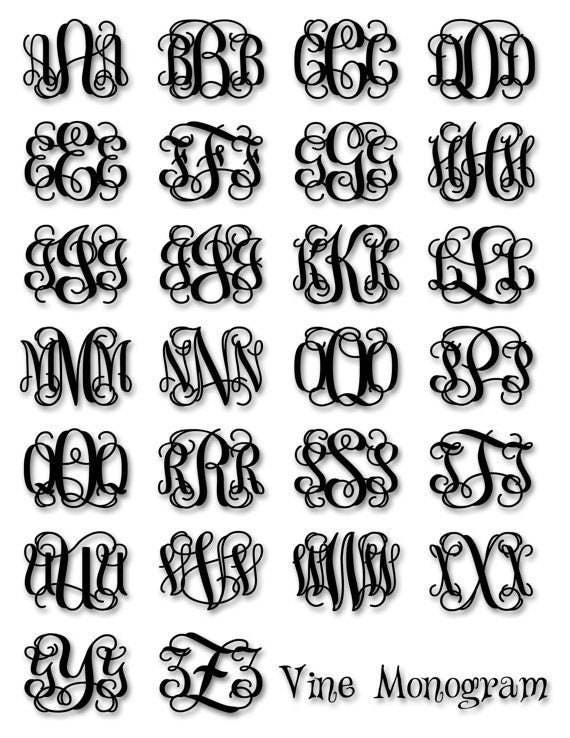 We not only use the computer program in our process of creating monograms, we manually edit each Monogram. If necessary, we extended or reduce some parts of the letters to make the letter more readable and creates the most beautiful monogram. We are more than happy to provide a digital proof before we cut your order. Just request a proof at check out :) The proof may extend your creation time because it will fist need to be approved before we create your physical monogram. If you have a required deliver date, please also include at check out. PLEASE NOTE: In the comments to seller box during check out - please let us know what letters you would like in the EXACT ORDER of how you want the letters to be created - from left to right. We can not be held accountable if letters are submitted in the incorrect order and can not grant refunds in such case. If you are unsure or have any questions please contact us we are always more than happy to assist. We accept various forms of payment: Visa, MasterCard, AmEx, Discover, Etsy. All orders must be properly paid before we are able to create your order. Example: If an unpainted Monogram has been paid for and you request a color at check out. Your order will be on hold until proper payment has been submitted, or unless otherwise advised by you. We very much value communication from our customers, if you do not actively check your etsy messages, please leave contact information to better avoid any serious delay on your order. PRODUCTION TIME: Our current production time is 5-7 business days. Production time count starts on the Next business day after the order is placed. PLEASE SUBMIT ORDERS WITH YOUR CORRECT AND CURRENT SHIPPING ADDRESS, if address changes need to be made to your order, there will be a standard $2 fee for address change. ✦All Orders will be shipped ground UPS or USPS Standard 2- 14 business days depending on package size. Please contact us immediately if your package reads as shipped & delivered, but you have not received it yet. ✦Pleases contact the shop if you have concerns on your shipping, I am ALWAYS more than happy to investigate and keep you updated. Although I can not do so if there is no customer communication on the concern. During holiday periods, there could be delays due to shipping black out dates, we can not be liable or any shipping black out dates, if you have time/ date sensitive orders. Please contact us prior to placing orders and ALWAYS include your required date in your order instructions. We can not issue refunds of any kind for any shipping delays. ✦✦PLEASE INCLUDE DATE REQUIRED ON ALL TIME SENSITIVE ORDERS, EVEN IN OUR RUSH CREATION LISTINGS! AND 3 DAY LISTINGS. On rare occasions, listing dates will be pushed back. SUMMIT ORDERS WITH YOUR CORRECT AND CURRENT SHIPPING ADDRESS, if address changes need to be made to your order, there will be a standard $2 fee for address change. Contact us for International shipping rate. If you would like us to expedite your shipping please inform us in the notes to seller at check out, and we will send you the additional fee owed on the rush shipment. The lady who packages your monograms and cake toppers is well trained and certified by Fedex. Our packages have a low damage rate although it will happen on rare occasions, if package damages happens we are always more than happy to assist you the best we can. -USPS is not always reliable, although they are the most cost effective way of shipping. -Sometimes tracking will not generate until package has been delivered. -My shop charges our customers what is charged to us to ship your item. We do not raise our item price to take in account for shipping price. ✦We will include the tracking information and insurance when shipping. Usually package arrives within a week. Please contact us immediately if your package reads as shipped & delivered, but you have not received it yet. A reshipping fee will apply for any returned orders. ✦Most of our items are customized to YOUR specification and therefore can not accept returns. ✦Please reach out to us if your order arrived damaged during shipment, or is flawed. ✦Please follow our Policy to insure no delays or incorrect orders. If our policy is not followed we can not be liable for your order and can not grant any kind of refunds, cancellations, or Returns. ✦If it has been agreed on return of the item, a reshipping fee WILL apply for any returned orders unless otherwise advised. ✦If you want to cancel an order, please cancel before its shipped, if order is canceled prior to shipment, there will be a cancellation fee.Please notify us immediately about any errors with your order – no later than within 1 business week. *Customer communication for all custom orders and time sensitive orders is very much appreciated. *Phone number is appreciated on all rush and custom orders. *More than anything we want our customers to be happy with their order without any complications. Please help us to ensure a positive experience with your order. *If your order arrived damaged: Please send us a photo if your item ; keep all shipping materials until father notice for us to process a claim and re-make your item. CHANGES/CANCELLATION: Please make any changes or cancellation no later than next business day you order to better ensure that it will be processed in time. If we already cut your item. We will not be able to grant any changes or cancellations. *Please note: For timely responses and great service, please message us though Etsy . Please make sure to place your order by the 7th of December. Any orders placed after December 7th will be subject to an additional Rush Creation and Rush Shipping Fee to insure timely delivery due to shipping cutoff and blackout dates. 1. Main side of monogram is painted, back remains natural light wood, edges remain natural wood tented in dark wood color after laser cut. - 3 day creation listings: Created in 3 *BUSINESS DAYS* not calendar days. - The shop is closed weekends, and we like to maintain healthy shop hours. - Business days are Monday - Friday. - Order creation time- these monograms are cut and sanded by hand. My shop very much values quality in our work and on rare occasions orders can be pushed back if there are quality issues. - If your order is time sensitive ALWAYS include the date that you need your monogram by. - All order details must be properly included in your order to better insure that there are no delays. DO NOT PROVIDED YOUR NAME. ALL LETTERS NEED TO BE SUBMITTED IN THE EXACT ORDER THAT IS TO BE CREATED. - If there is any confusion with the way the letters were submitted this may delay your order. - Please follow our Policy to insure no delays or incorrect orders. If our policy is not followed we can not be liable for your order and can not grant any kind of refunds, cancellations, or returns. For Christmas order, please make sure to place your order by the 7th of December. Any orders placed after December 7th will be subject to an additional Rush Creation and Rush Shipping Fee to ensure timely delivery due to shipping cutoff and blackout dates. *We do not require names and will not be held accountable if letters are submitted in the incorrect or an confusing order, and will not grant refunds or a return. * We will be unable to accept any returns or issue refunds if submitted with errors, if you submit your order in error PLEASE contact us within the next 24-48 hours to advise us of the corrected instructions. ✦It may slightly delay your order creation time although, it will better insure quality in your monogram. ✦All proofs will need to be approved before we can cut your item. ✦If you request a proof, and want to make changes to your monogram that is outside of our template, there will be an additional fee. ✦Due to all orders being custom made, we are unable to accept returns and all sales are final.